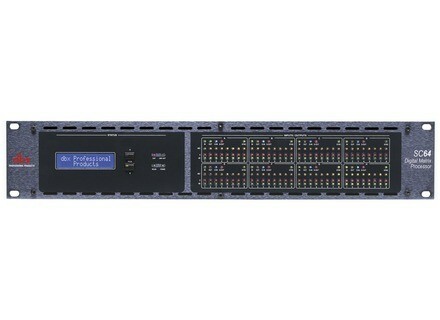 SC 64, Digital PA Controller from dbx. Dbx® Professional Products is introducing the new SC 64 (System Core) and SC 32 Digital Matrix Processors. The SC 64 and SC 32 host a total of 64 and 32 analog I/O respectively, configurable in banks of eight. Eight analog input cards and eight analog output cards facilitates different fully loaded configurations, accommodating a wide range of standard sources via the onboard mic/line and Phantom Power switching per input. Two high-speed option slots on the SC 64 and one high-speed option slot on the SC 32 also provide an interface for adding forthcoming high bandwidth audio transport I/O cards. The units feature dedicated DSP for common processing functions as well as insert positions for specialized processing and popular audio tools including dbx Advanced Feedback Suppression™ (AFS™), Ambient Noise Compensation (ANC), priority ducking, parametric equalization (PEQ), delay and dynamics. Additionally, the new SC 64 and SC 32 devices offer a diverse range of control options including HiQnet™ System Architect custom control panels, as well as Ethernet, serial, contact closure control, ZC wall controllers and automatically scheduled events. An optional media engine facilitates delayed paging and storage of audio files for scheduled playback. [NAMM] dbx Driverack PX Dbx® Professional Products introduces the new DriveRack® PX Powered Speaker Optimizer, the latest in the dbx DriveRack family of products. [NAMM] Four new members for BSS Soundweb BSS Audio introduce four new digital controlers to their Soundweb London family : the BLU-800, BLU-320, BLU-160 and BLU-120. [NAMM] Cakewalk The Minimoog Tribute Cakewalk today announces The Minimoog Tribute Expansion Pack for Rapture and Rapture LE.